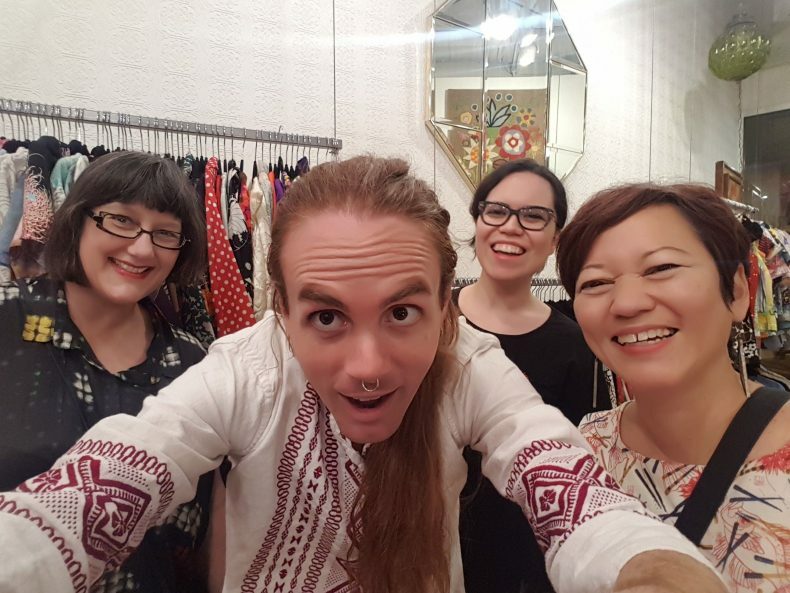 New Zealand and Pacific collections intern Sonya Withers and history curator Claire Regnault recently travelled to Hawai‘i where they collected 83 aloha shirts with a focus on indigenous Hawaiian designers. Claire Regnault reflects on the connection these designers have with their natural environment and how this inspires their designs. In October, Sonya Withers and I travelled to Hawai‘i to work with Noelle Kahanu, a cultural specialist from University of Hawai‘i’s Public Humanities and Native Hawaiian Program, on a co-collecting project for the Pacific Cultures team. 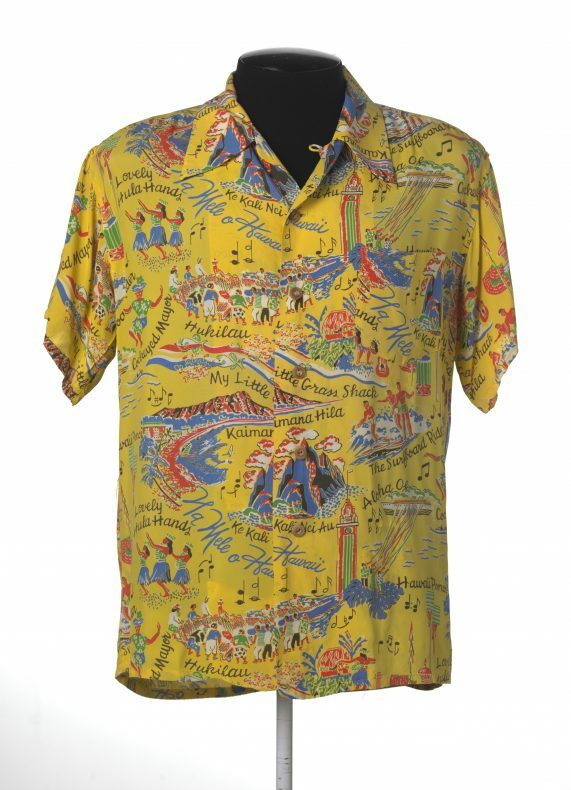 Aloha shirt by Malihini featuring Hawaiian mele (songs), c. 1950. This shirt belonged to Tommy Holmes. Te Papa. Rather than developing a survey collection of aloha shirts throughout the decades, we chose to focus primarily on how Hawaiian culture has been represented through the aloha shirt, and on native Hawaiian designers who have reclaimed the aloha shirt as a canvas for communicating indigenous cultural values. 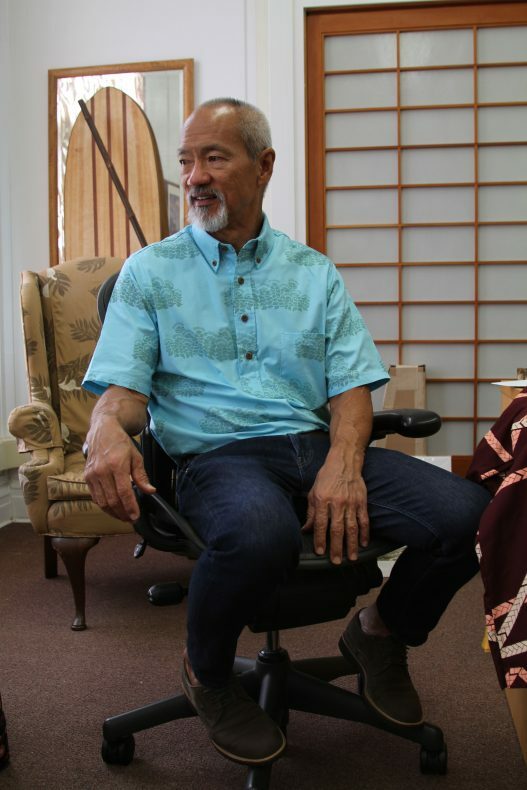 In Hilo, we met Sig Zane, one of the ‘grandfathers’ of indigenous aloha shirt design. Sig’s design career began when he fell for Nalani Kanakaole, a hula dancer from a renowned family of cultural practitioners. He used pattern and print to woo her. Sig Zane in his office in Hilo, fresh from the morning surf. 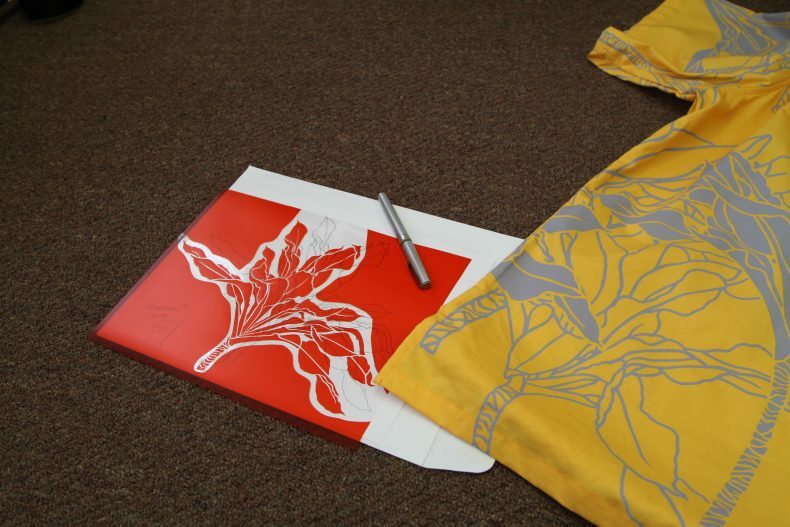 Sig’s screen-prints worked their magic, and since the mid-1980s, he has crafted designs steeped in hula culture. 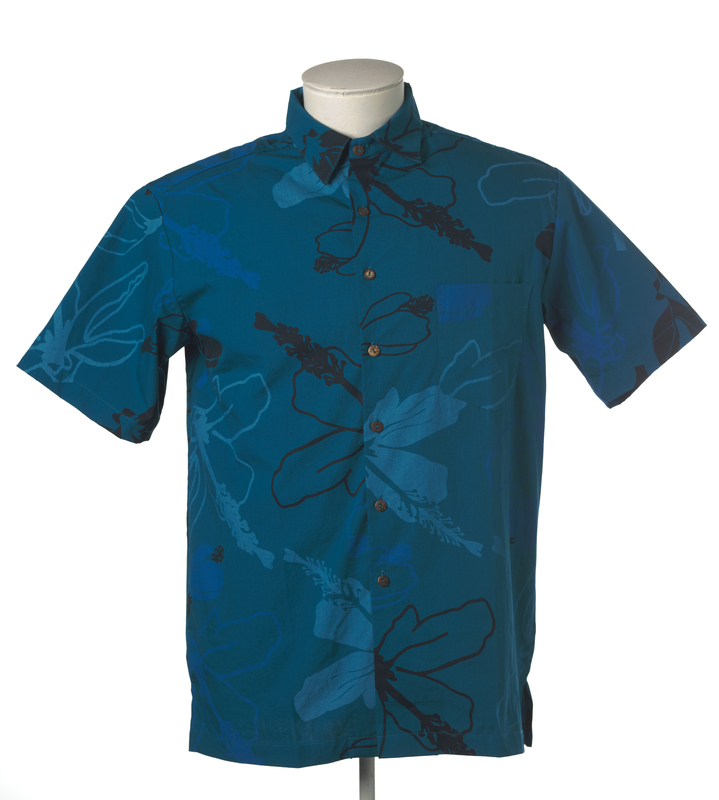 When we met with Sig he was wearing a shirt adorned with lehua blossoms – the flower of Laka, the goddess of the hula. Hula dancers traditionally wear lehua blossoms around their heads, wrists and ankles. The ʻōhiʻa lehua, which is also known as Pele’s flower or the fire tree, comes from the same family as our pohutukawa. In Hawaiian mythology, ʻŌhiʻa and Lehua were lovers. 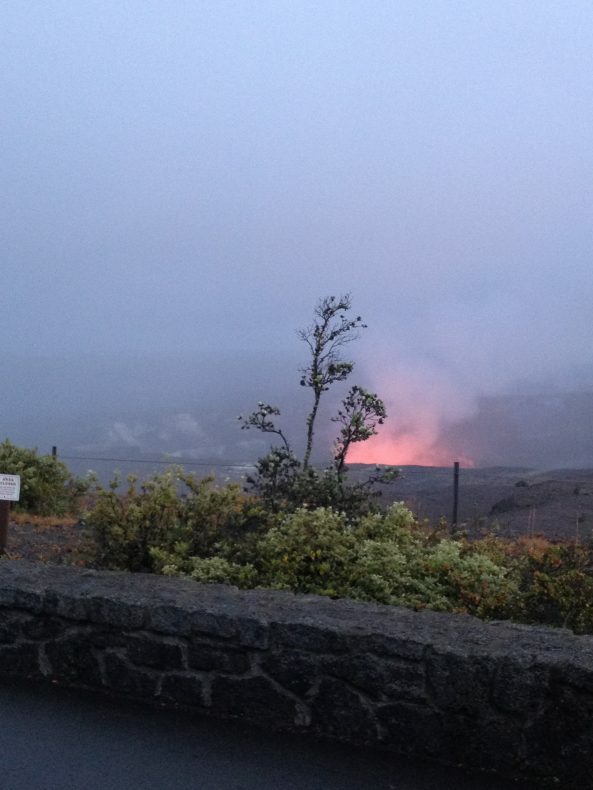 Pele, the volcano goddess, however, was also in love with ʻŌhiʻa. When ʻŌhiʻa rejected her advances, Pele turned him into a tree. Out of pity, the other gods turned the distressed Lehua into a flower, and placed her upon the ʻōhiʻa tree. It is said that when a lehua flower is picked from the tree, the sky will fill with rain – the separated lovers’ tears. 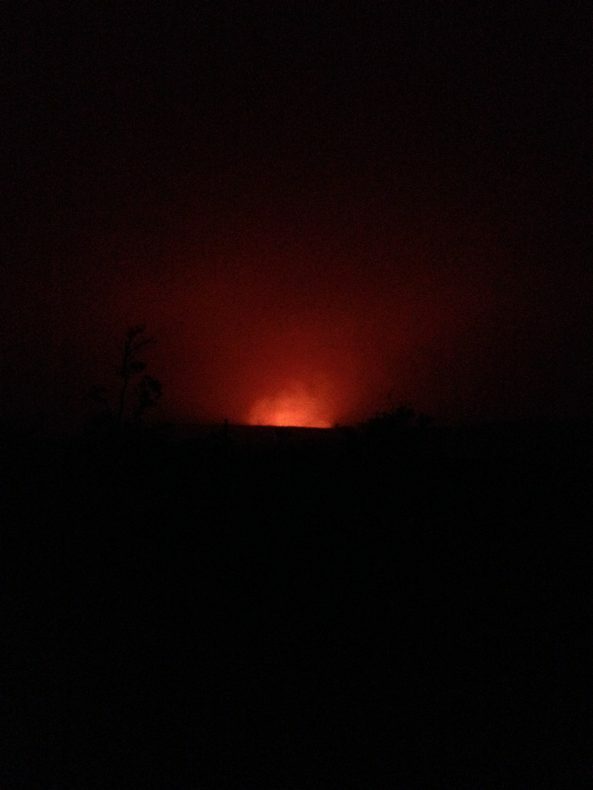 The ʻōhiʻa lehua is prevalent in the rainy, volcanic landscape surrounding Hilo. Indigenous Hawaiian plants are also an important source of inspiration for the women behind Kealopiko. Ane Bakutis and Hina Kneubuhl, two of the company’s founders, are both trained botanists, and involved in Hawaiʻi’s Plant Extinction Prevention Program. We met with them at their home-based studio on the island of Molokaʻi, where they dye and screen-print their fabrics. As many of their designs are place-based, Hina and Ane also took us for a walk through one of their places of inspiration – Kapuaiwa Beach Park, an ancient coconut grove planted in the 1860s during the reign of King Kamehameha V. It was originally planted with a thousand coconut trees – one tree for each of the king’s warriors. Deliberating using clothing as an educational tool – “everyone loves clothes” – Ane, Hina and their third member, Jamie Makasobe, showcase Hawaiʻi’s rare plants, animals, cultural practices, and language through their designs. These are developed not in accord to fashion’s seasons, but with those of the gods, Lono and Kū. 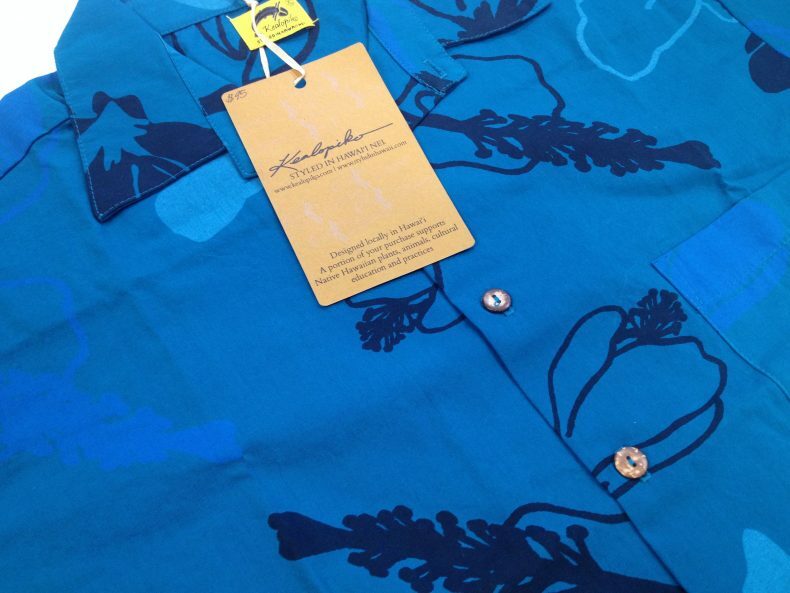 One of the Kū season shirts we collected features pua aloalo flowers. Unlike most of the hibiscus flowers depicted on aloha shirts, the pua aloalo is indigenous to Hawaiʻi. It’s one of a few fragrant species of its genus in the world, Hibiscus arnottianus. In keeping with Kealopiko’s educational focus, the swing tag for the shirt provides wearers not only with information about the flower but also a call to action. Each year the company gives a percentage of their profits to environmental or cultural programmes. These modern-day aloha shirts are not just statements of love for place, but calls-to-action to nurture and preserve the very things that make up the spirit of Hawaiʻi. Quoted in Dale Hope, The Aloha Shirt: Spirit of the Islands, Patagonia, 2016, p.31. Thank you for this surprisingly interesting item. Fabulous project Claire and team. Loved reading this!